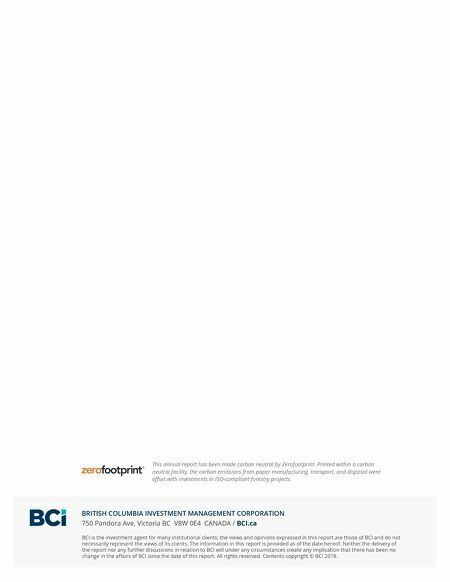 BRITISH COLUMBIA INVESTMENT MANAGEMENT CORPORATION 750 Pandora Ave, Victoria BC V8W 0E4 CANADA / BCI.ca BCI is the investment agent for many institutional clients; the views and opinions expressed in this report are those of BCI and do not necessarily represent the views of its clients. The information in this report is provided as of the date hereof. Neither the delivery of the report nor any further discussions in relation to BCI will under any circumstances create any implication that there has been no change in the affairs of BCI since the date of this report. All rights reserved. Contents copyright © BCI 2018. This annual report has been made carbon neutral by Zerofootprint. Printed within a carbon neutral facility, the carbon emissions from paper manufacturing, transport, and disposal were offset with investments in ISO-compliant forestry projects.